Natural pearls – is a profitable investment of funds. Decoration in the form of a string of pearls to transform any outfit. It is appropriate as a wedding gown, and evening, and even with a business suit. This is a classic that is always in fashion. Articles of natural pearls valued since ancient times and are considered to be the exquisite decoration. The high cost of gems is due to their long maturation and the difficulty of obtaining. Genuine natural pearls. This kind of pearls are made by mollusks from beginning to end without human intervention. It is produced in the Indian ocean and the Persian Gulf. The cost of one of the pearls of natural origin can range from $ 1,000 to $ 10,000. Natural sea pearls, cultured man. A pearl inside the clam Matures up to two years. Human involvement is to trigger and control the process. The advantage of this pearl of the ability to control the size, shape and color pearls. Despite the fact that the production of cultured pearls is much easier, the cost of one of the pearls varies from $ 100 to $ 600. Black cultured pearl necklace worth $ 1000 for just one pearl. Features genuine cultured pearls, grown in river water, lower compared to the sea. Therefore, it costs much cheaper: from $ 20 to $ 100 for one pearl. Artificial pearls are considered when its formation does not require the participation of living organisms. It can be done so well that at first glance difficult to distinguish the fake from the original. 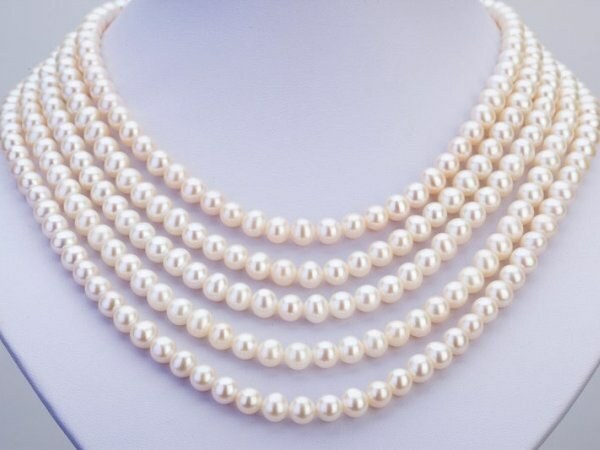 Regardless of quality, cultured pearls are much cheaper natural. What criteria can you distinguish real pearls from faux to not fall for the tricks of swindlers? One way is to check the roughness of the pearls. Its disadvantage is that you will only find natural pearls. Natural cultured pearls can be perfectly smooth, because its formation was monitored. Real pearls are heavier than artificial, because the pearl is not hollow inside. Before buying, weigh the pearls in his hand. Drilled holes in the pearls are also important criteria. When drilling a cultured pearl can be formed, the chipped top coat. Careful consideration of each pearl, you will notice appearing plastic. If a piece already purchased, test its naturalness is possible by means of lighters. Take pearl over fire, natural pearls will remain unchanged, and the fake will melt. So pearl became the best monetary investment for hundreds of years, handed down by inheritance, it is recommended to store it in the pouch of soft fabric (velvet, velour, etc.). After contact with skin, wipe the pearls with a soft cloth to remove skin oil, cosmetics and perfume.